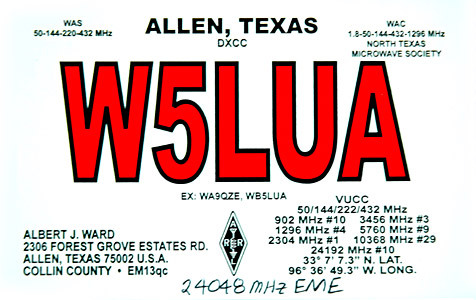 I made a QSO with W5LUA, he was very strong with me but I learned that my understanding of doppler was not correct. I must do some study to better understand the doppler. 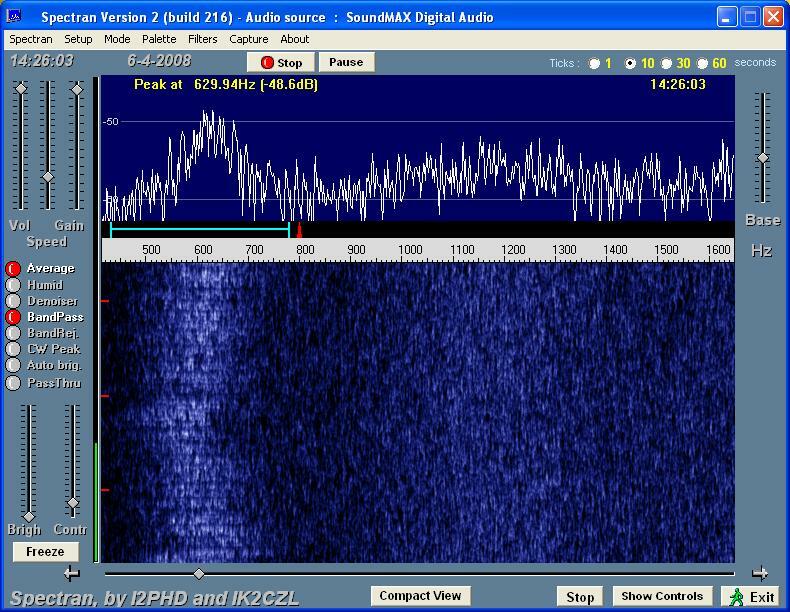 My misunderstanding was no problem because Al was very strong and even when I was searching 30 khz below the right frequency I easily found his signal. 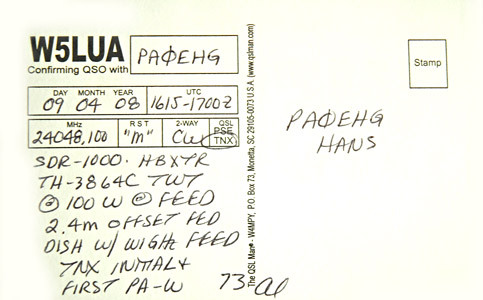 Listen to the signal from W5LUA during our QSO. 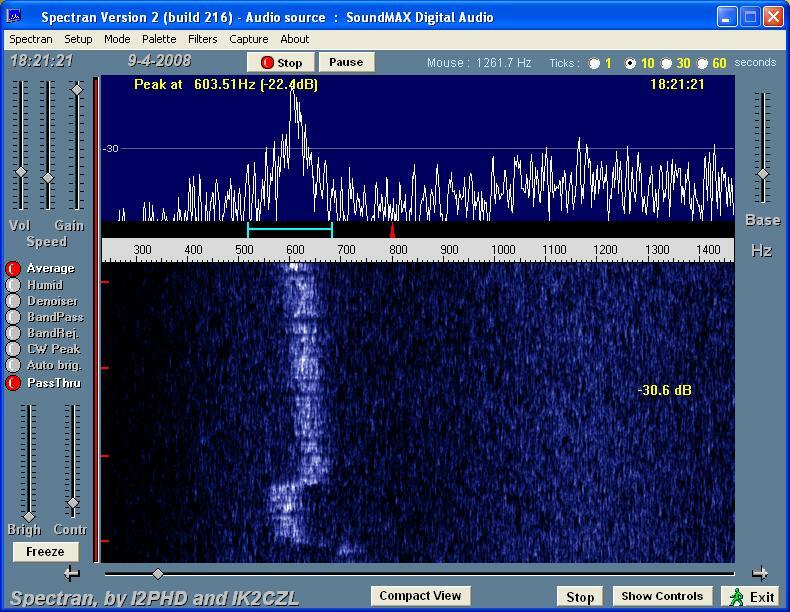 Its hard to imagine that this is the same station as the audio I first heard on 9 march from Al. 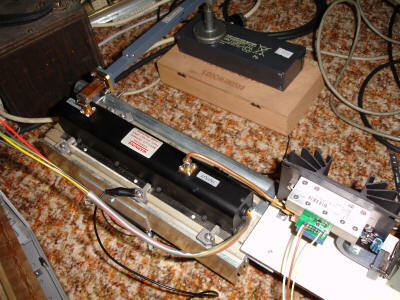 After the redesign of the transmitter and a change to the doubler I was ready to make a new test. I made a sked with LX1DB who had a very strong signal. 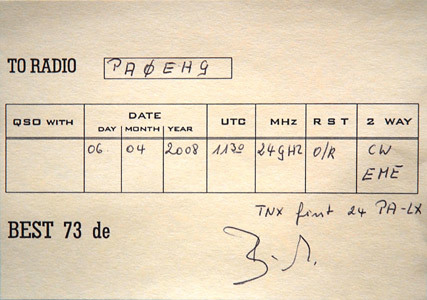 In total I made 4 QSO's today. 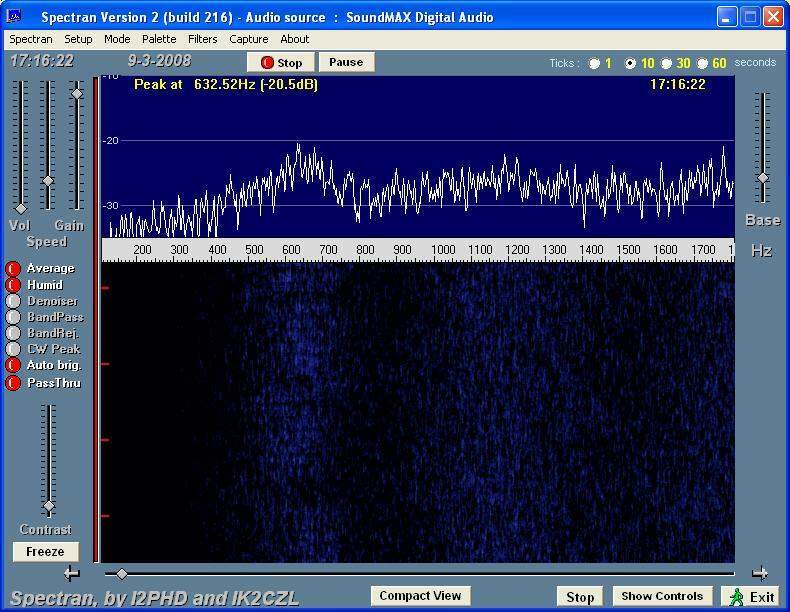 OK1KIR also copied my signals but unfortunately he was having problems with his system. We will try again later. 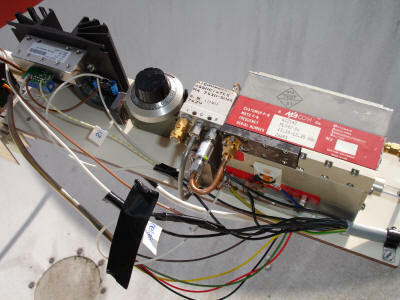 After I build up my TX system into the dish I did my first test and found that the TX was not working. After a short time I found the doubler from 12 to 24 GHz broken, I changed this for a new one and the TX worked for one transmission and then again no output. Something was wrong in my setup so test for today were stopped. I started today to measure the moonnoise. 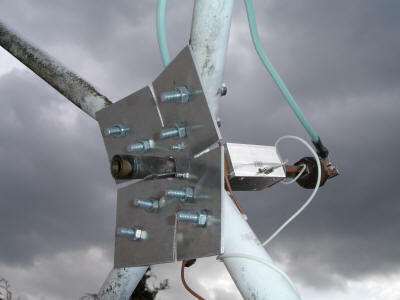 After several measurements the maximum value I measured was 2.4 dB with clouded sky. So my dish performance looks OK. 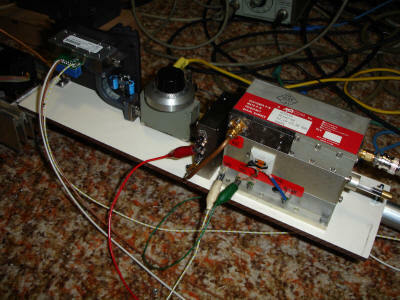 I also completed the build-up for my transmitter and made everything ready for my first test. I tried today if my dish feed was correct in the focus because the measured solar noise and moon noise was a little bit low compared to others. This was a day with good weather but much wind. 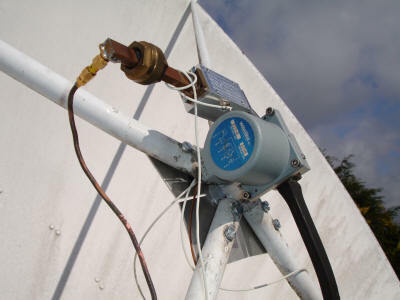 When I started I measured 12.9 dB solar noise. 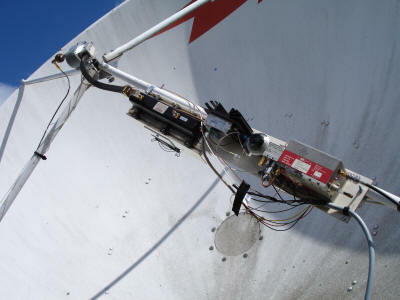 I shifted the focus about 2 mm closer to the dish and I measured 13.5 dB. I total I shifted the feed 4 times and at the end I measured 15.2 dB solar noise. This is an improvement of 2.3 dB which is a lot. 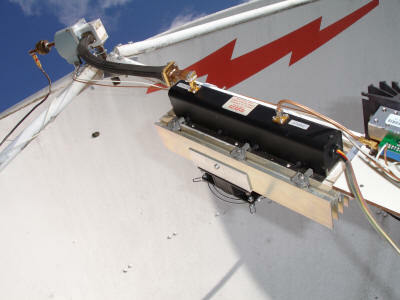 I have been working the last week to get my transmitter up and running and at this moment I have a setup of a 12 GHz brick followed by a doubler, than a 0.5 Watt solid state amplifier and than the Hughes TWT which I used several years ago with my first experiments to get power. With the improved drive I now measure about 12 Watt output. 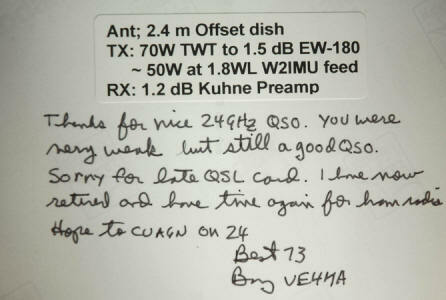 I want to try next week to be QRV for my first EME test. 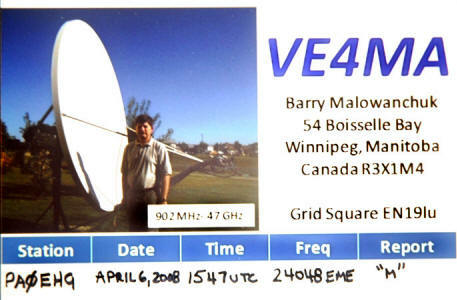 On 9 march 2008 I copied my first EME signals on 24 GHz. 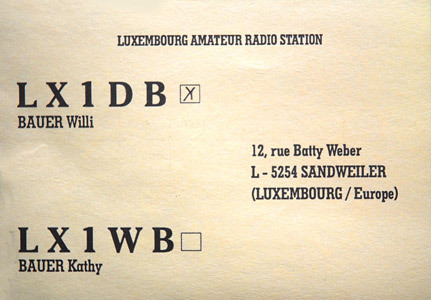 I copied signals from OK1KIR, W5LUA, VE4MA and LX1DB. 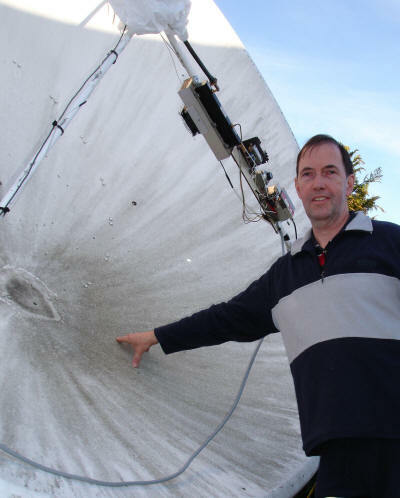 Signals were very weak and very noisy due to spreading. This might be caused by the rain which was falling. During the test the weather was not good, we had about 1 to 3 mm per hour rain all the day. 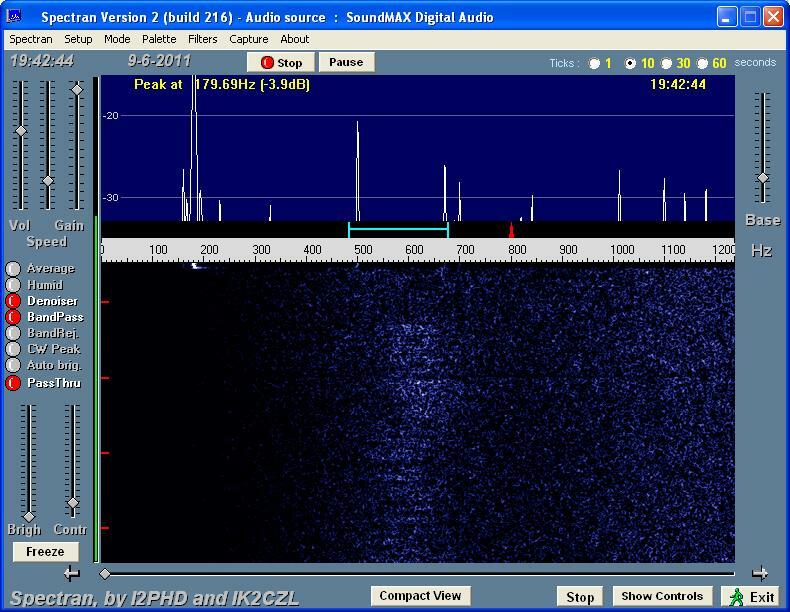 In the Spectran waterfall you can see the signal from OK1KIR. 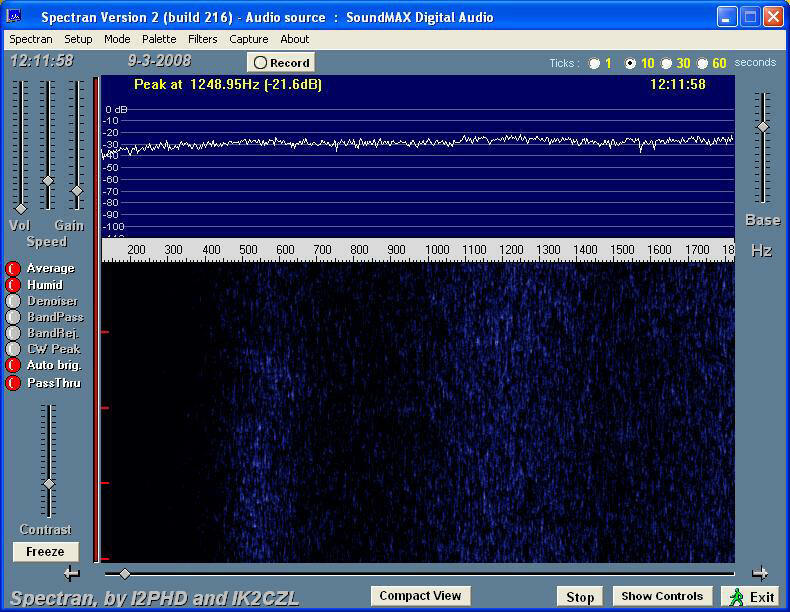 In the second waterfall you can see me tuning over the signal from VE4MA. 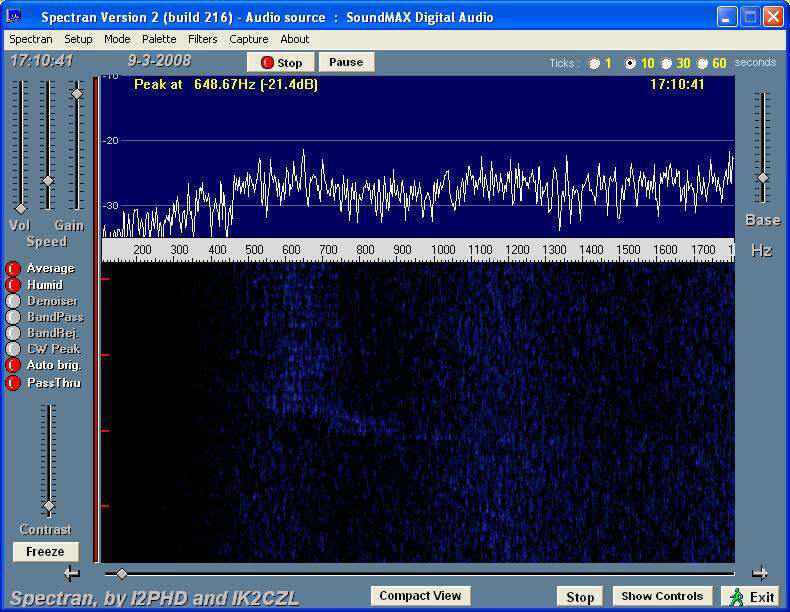 The signal from W5LUA the strongest signal I heard during this weekend.